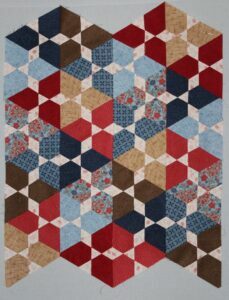 I want to say thank you to everyone that left such wonderful comments regarding my Lincoln quilt. In fact, I am a bit overwhelmed with the response. 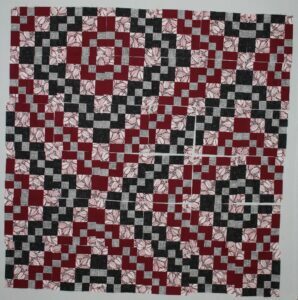 This last week I have been working on the Domino pattern from The Casual Quilter by Robin Strobel. 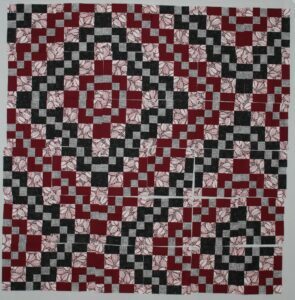 Several years ago I realized that I have quilting books that contain only one pattern that I am interested in and Domino is one such pattern. Once I make the one quilt I am interested in, the book is donated to the quilt guild’s library. This quilt top went together quickly. 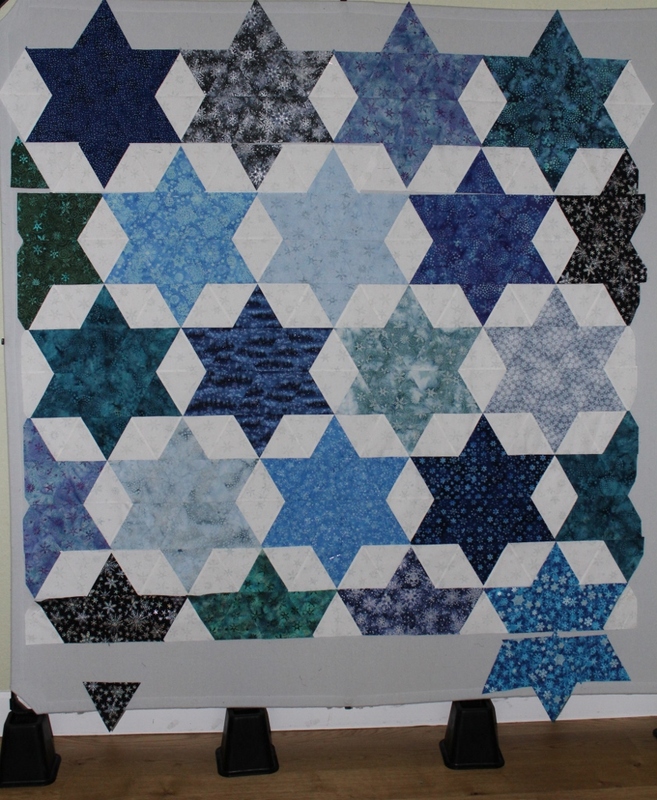 All the blocks were pieced on Thursday & Friday and on Saturday I played with layouts. Playtime was the big reason that I liked this pattern. This is the first attempt. A good starting place, but needs a bit more rearranging, so I moved the first column of blocks so they became the last column. This is looking better, but what would happen if I moved the top row to the bottom? Yes, this is the one I like the best. All that was left to do was to sew the blocks together and add the borders. 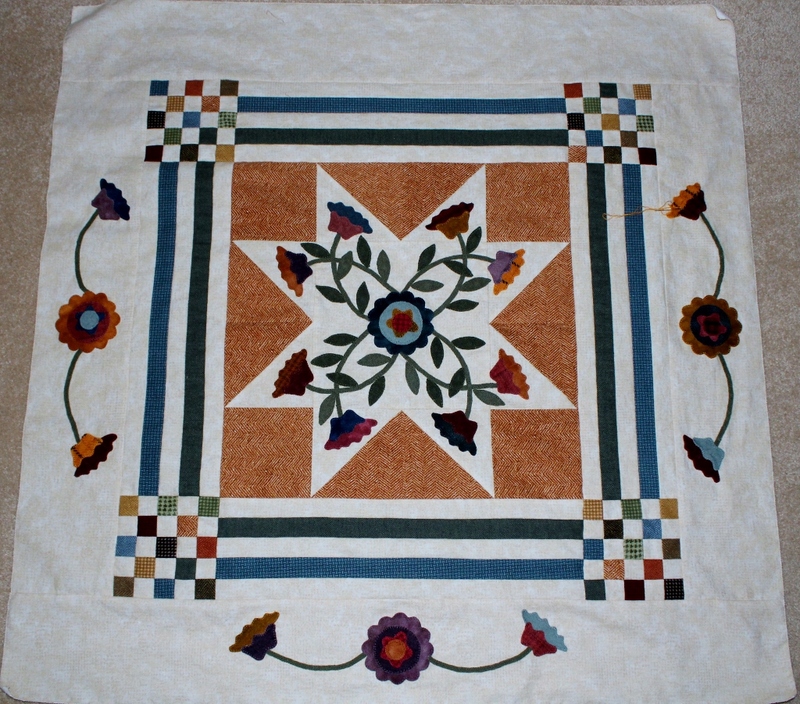 The quilt top finished at 62 1/2″ square. My current leader/ender has been 9-patch & hourglass blocks out of recycled shirt fabric. I think that I will piece that top while I am considering my next project. Next week I will be attending the HMQS in Salt Lake City, so this is a great project to finish up before I leave. Actually the design wall is empty at the moment while I finish some projects. Here is the status on my end-of-year to-do list. 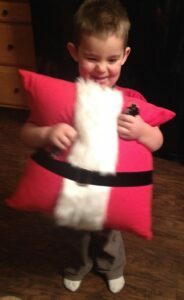 #1 – Santa pillow – Done and Theo approved. #2 – Hem pants – Done and delivered. 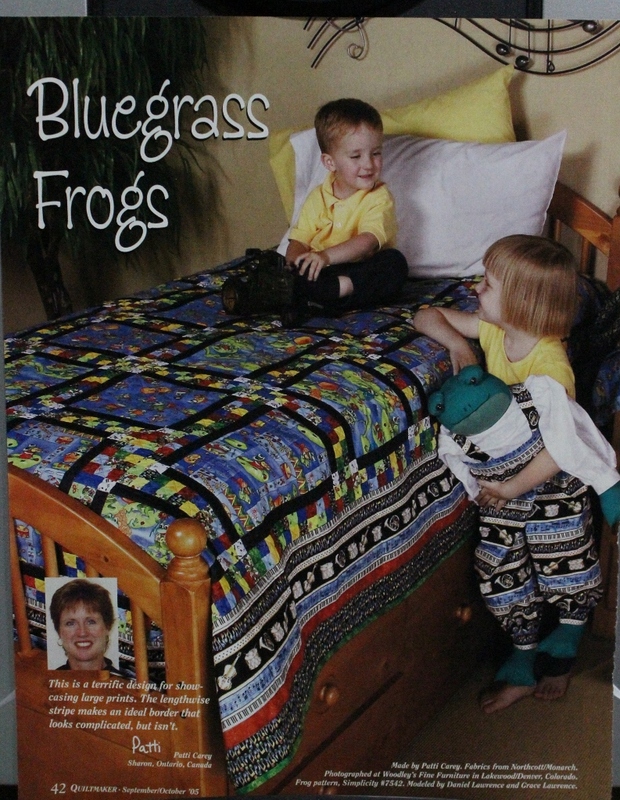 #4 – Machine quilt Bluegrass Frogs – Started. I don’t think that this one will get done, but I plan to work on it tomorrow and Wednesday. 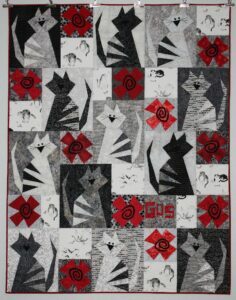 #5 – Embroider whiskers on Gus quilt – Done and I love it. #6 – Strip Ribbons – Done. Dark brown sashing removed and cream sashing inserted which I think looks a lot better. Considering the holidays, I think that 5 out of 6 projects completed is good. 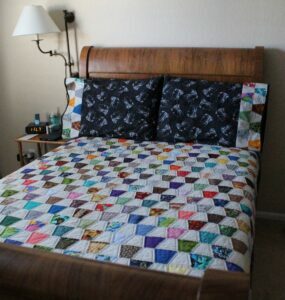 Recently I came across a quilt that my Mom had pieced and hand quilted. The only part left to do is the binding, so I am adding that to my list. 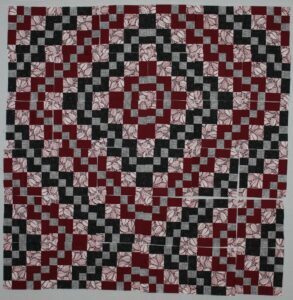 I believe that Mom’s plan was to add a ruffled bed skirt/border to three sides of the quilt, but I will just bind it with the black calico fabric. There has also been some organizing of the sewing room. I have a long list of projects for 2016, so it will be great to start with a clean work area. I can’t believe how long it takes to plan and piece each checkerboard sashing, but it is almost finished – just one more side. 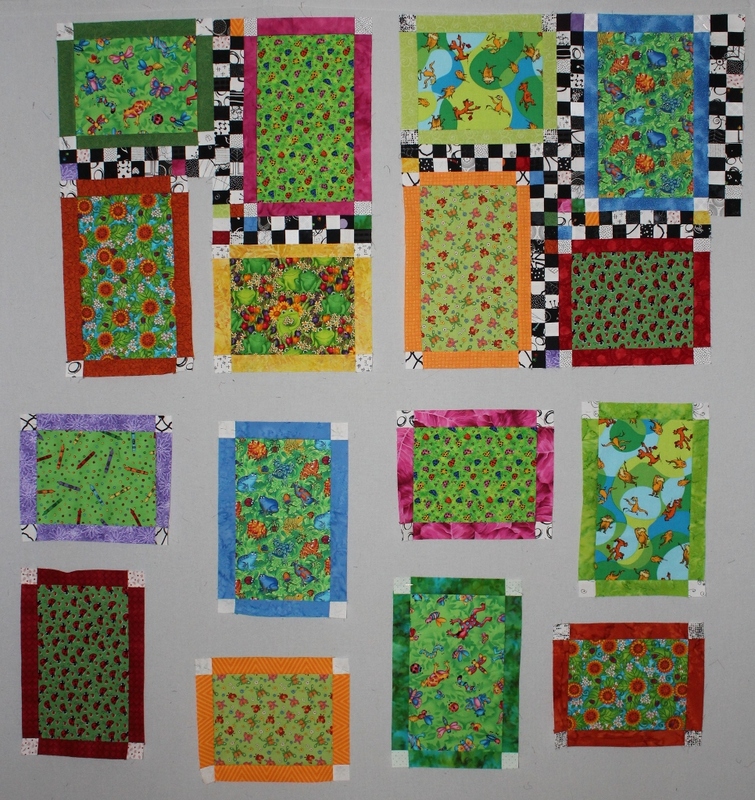 The quilt top will be finished with a 1 1/2″ black inner border and a 3 1/2″ green border. I think that I will go ahead and machine quilt the top once it is completed. Well the border won’t sew itself, so I had better get back to it. Check out all the other projects at Judy’s Design Wall Monday. Thanksgiving weekend was quiet, but I made some progress on Bluegrass Frogs. 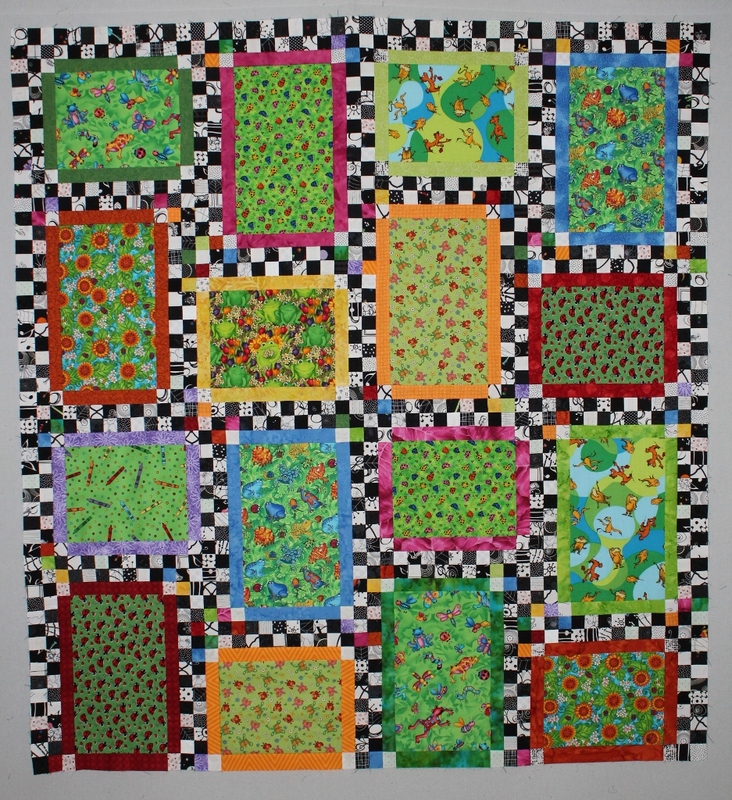 The pattern called for black as the frame for the focus fabric, but I used a variety of bright colors. Also the sashing called for a random assortment of colors, but instead I wanted a black & white checkerboard. However once I started sewing the sashing I realized that there would be places where two black or two white squares touched. My solution was to use a bright color in those positions. 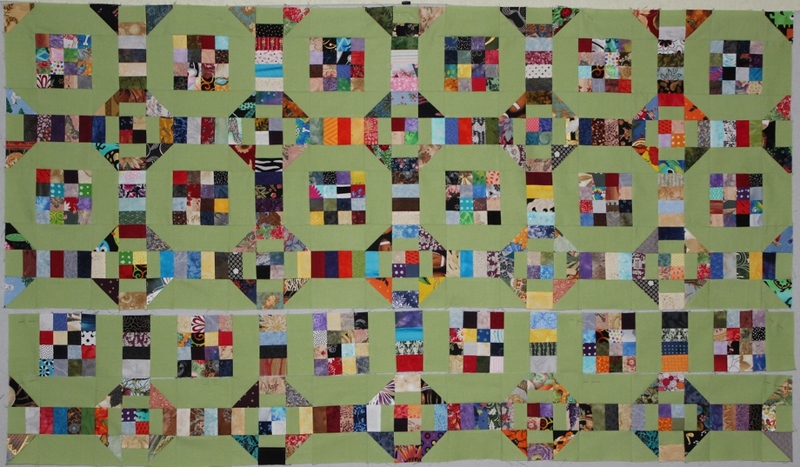 I like how bright & cheerful it makes the whole quilt appear. I also found some time to work on the wool applique for Star of Yesterday. All the vines and flowers are appliqued on the top, so all that is left are the leaves. The plan is to have this top finished by the end of December. 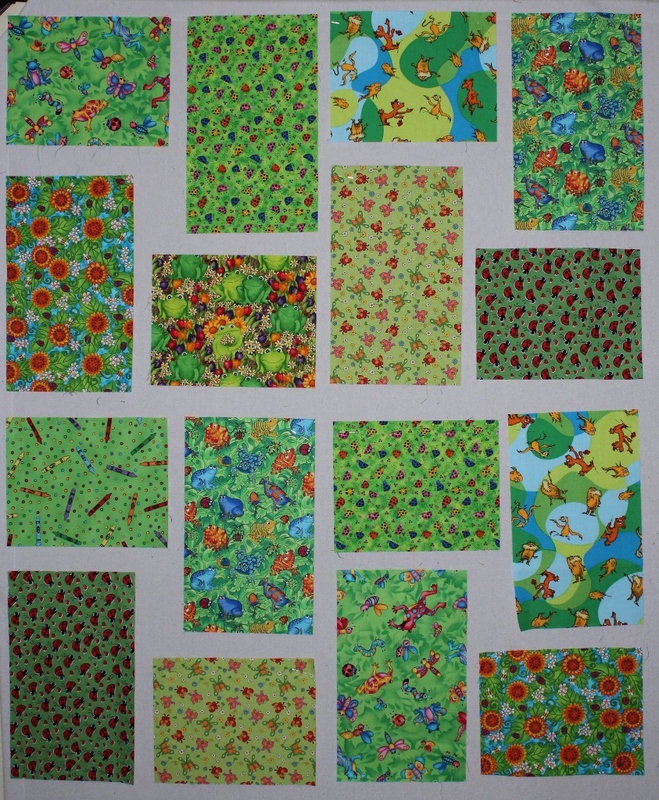 This is another pattern to which I made several color changes. 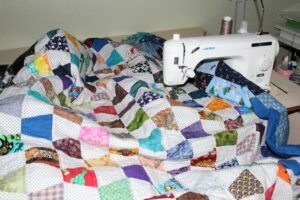 What fun it is to make a quilt your own! Check out Judy’s Design Wall Monday and see what everyone else is working on. Even with the pre-holiday madness and babysitting grandchildren, I manage to find some time to finish Mini-Lotus. This little quilt is going to be a doll quilt for my youngest granddaughter – Presley. With some careful pinning, Mini-Lotus was an easy quilt to sew. However I did have some issues with the directions. Oh wait – that isn’t the first time that you have heard me say that this year! Even though I don’t particularly like patterns that call for trimming excess blocks to square a side, I will do it on this top once it is quilted. The biggest issue was that the directions said to cut out enough pieces to make 32 blocks, but only use 28 in the top. Why make more blocks that you need? 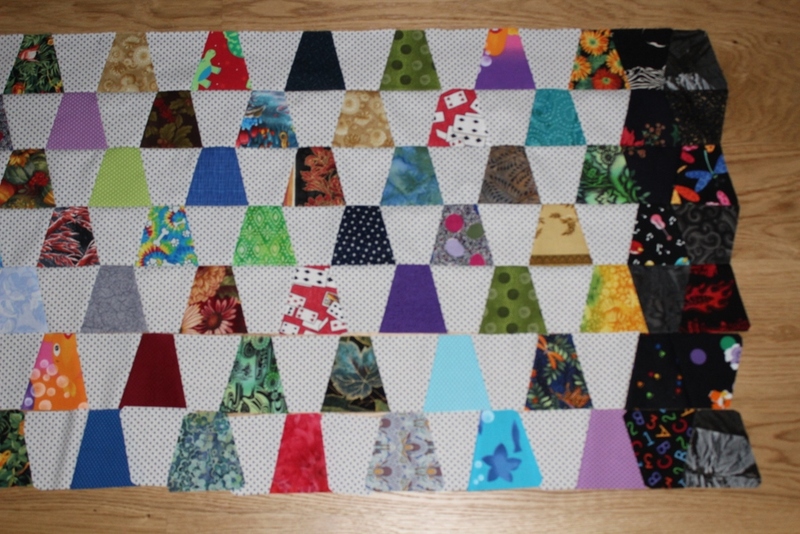 So as you can tell from the picture, I used all 32 blocks in my quilt which makes it square instead of rectangle. It may seem like a small thing, but it is a waste of my time and fabric. I also found some time to start cutting pieces for Bluegrass Frogs. The quilt as pictured is long twin – 70″ x 103″ – with 6 blocks and a 10″ border. 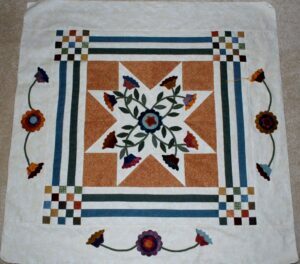 I am going to make 4 blocks and decide on the border later, so I am not sure how large it will be. 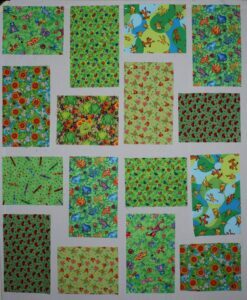 I have been collecting bug fabric with a green background for this quilt. Right now it is time to machine quilt Mini-Lotus – Christmas is right around the corner. 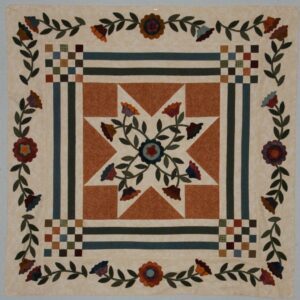 Check out all the other quilting eye candy at Judy’s Design Wall Monday. The Scrappy Something quilt top is half finished, but check out all those little scraps that have found a home. 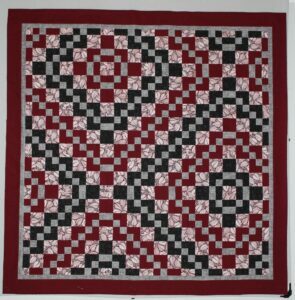 There are a two main reasons that I decided to make this quilt – it is a great leader/ender project and it uses a bunch of 1 1/2″ squares and 1 1/2″ x 2 1/2″ rectangles. I think that this is going to be a great charity quilt. The second half of the top will go a bit slower since I discovered that I need more 16-patch blocks. Well, technically this isn’t about my design wall but rather the machine quilting on my Tumbler quilt. I am using King Tut’s Joseph’s Coat for the top thread and a medium blue – just put in my 5th bobbin – for the bottom. The straight stitching can get a bit boring, so I sew 3 or 4 rows then take a break. 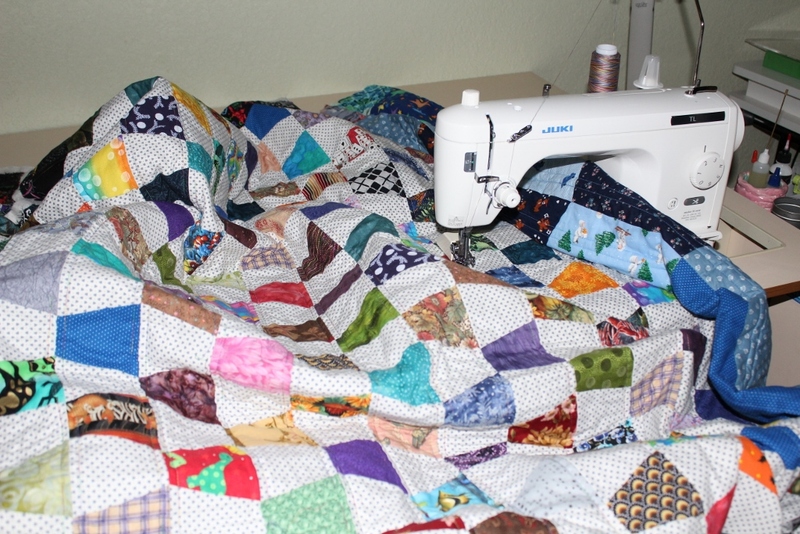 I am already over half done, so the plan is to have the quilt ready for binding by Friday. Thanks to everyone for the kind comments on my giant tumbler backing. 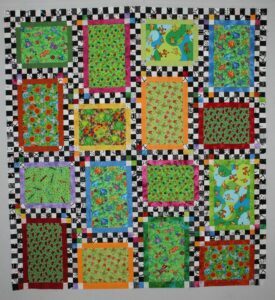 I plan to move more of my ideas from my head or scraps of paper into actual quilts – in fact there is a sunflower quilt idea that is on my 2016 list. 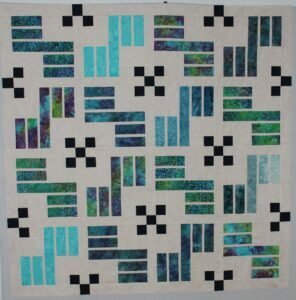 Check out other quilting ideas at Judy’s Design Wall Monday. There are only a couple more days left in September and I have been sewing like crazy to get the Pathway Quilt top finished this month. I am using medium gray thread for the middle, but since there will be so many white background triangles for the top and bottom rows I will switch to a light silver gray thread for them. The fourth row from the top is the one that needs to be redone so that the seams are pressed the correct direction. Then the decision regarding the borders must be made. 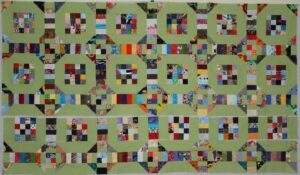 The tumbler quilt is also growing – 15 rows now. 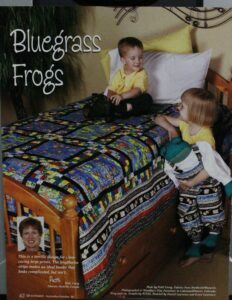 I think that this is one quilt that will actually look better on a bed that on my design floor. 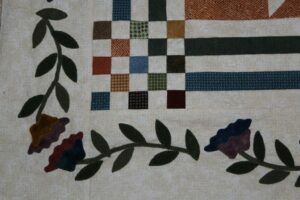 In the evening while watching TV I have been working on the wool applique for the Star of Yesterday. The vines and flowers are being attached all around the border first, then I will go back and add all the leaves. Check out Judy’s Design Wall Monday for more quilt inspiration. Pathway Star is slowly coming together – the cutting is easy & the sewing is easy, but keeping organized has been a challenge. I need to keep track of the bias sides of the triangles, the direction the seams are pressed and keep all the same star fabric together. In fact I was wondering if today was Friday the 13th – I sewed seams together incorrectly, ripped them out and then resewed them incorrectly again. Right now I am taking a break before I start all over again. 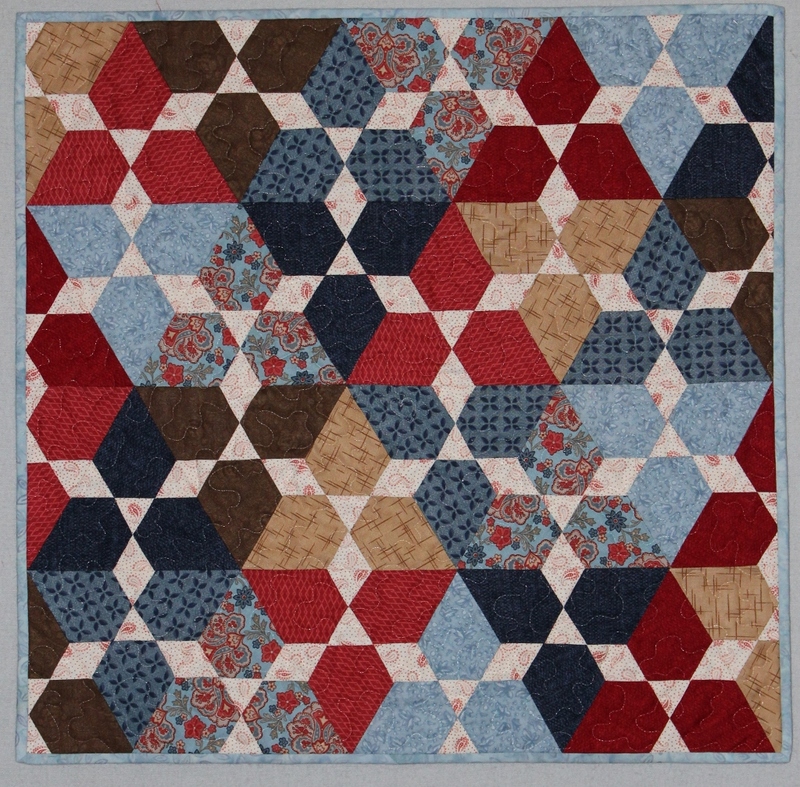 It is easier to move fat quarters around than to move 12 triangles. There are also four half star units for the beginning and ending of rows 2 & 4 that need a fabric decision, but I think that this layout is close to the final design. The plan is to have this finished by the end of the month, so I need to sew almost two rows a day. That is doable, isn’t it? The tumblers are slowly growing as my leader/ender. 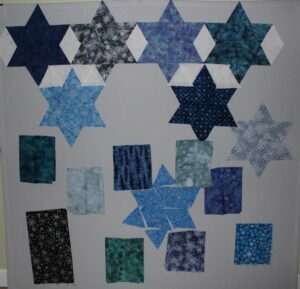 Once Pathway Star is off my design wall I will be able to get a better picture. 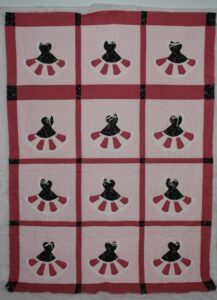 I am really liking the black border on the quilt. The plan is to have this one finished by the end of October. 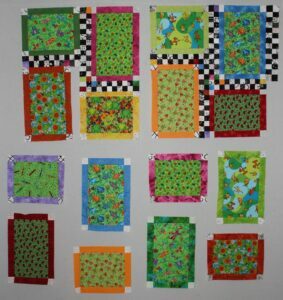 Check out the quilt inspiration at Judy’s Design Wall Monday.